Daylight, space, natural ventilation, noise reduction, and energy and resource efficiency are the top five things Victorians want from their apartments, according to feedback on the state government’s Better Apartments discussion paper, showing there is an appetite for sustainable apartment developments. 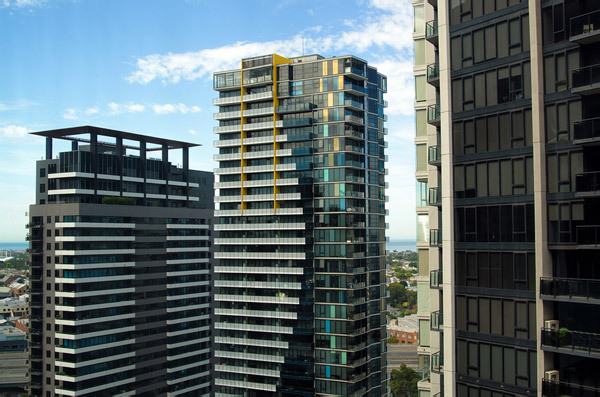 The discussion on size, quality and planning of medium- and high-density apartment projects in Victoria was opened in May last year when the state government and Office of the Victorian Government Architect began the Better Apartments project, following concern over the quality of housing stock being built, particularly in the Melbourne CBD. “We need to encourage a higher standard of apartment design to avoid poorly designed homes lacking space, light and ventilation,” planning minister Richard Wynne said at the time. Community input was called for in the form of written submissions as well as a survey, and now the results are in. For the survey, 1701 people responded – 622 community members living in apartments, 591 not living in apartments and 446 people from industry. 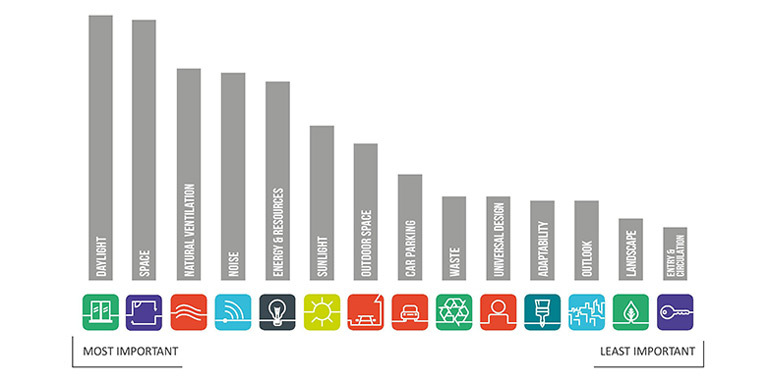 Looking at the results it becomes obvious that sustainability and quality are of high concern to Victorians, with nine of the 14 key issues common elements covered in sustainability rating tools. Car parking is far down the list at number eight, corresponding with a growing trend in apartments to minimise or remove car parking. Taking a deeper dive into attitudes, the survey found 80 per cent of people thought natural light and good ventilation were “essential”, and 76 per cent of people agreed with minimum apartment sizes. More than a third of people living in apartments rated energy and resource efficiency as the most important factor, and it ranked fifth overall. “Overall the findings indicate an engaged community with strong emotional connections to apartment living – many respondents have made the decision to live in an apartment and highly value what it offers,” the report said. The public outreach process also involved written submissions; a minister’s forum; community, industry and local government workshops; and interviews with key stakeholders. In the written submissions and workshops, there were some differences between stakeholder groups. Councils were very supportive of better managing the amenity of apartments through additional guidance in the planning and possibly building systems. Many stakeholders proposed achieving a higher minimum green star rating as an effective means of improving the energy efficiency of apartment buildings. Others suggested that energy and resource issues should be addressed at the planning stage. “The Building Code deals with some aspects of energy efficiency such as the thermal rating of materials and star rating of appliances, however better outcomes can be achieved if building design is assessed for ESD at the planning stage,” the City of Brimbank said. The development industry, however, voiced concerns about the impact of new standards on development costs and the flow on effects regarding affordability. There were also members of the development community (including the Building Designers Association of Victoria, Urban Development Institute of Australia and the Property Council of Australia) that argued there was no evidence the National Construction Code was deficient (see here, here, here and here), that planning provisions should not be more onerous than the NCC, and that overlapping regulation could mean more “red tape” and delays, with design standards inconsistent with the NCC potentially placing Melbourne at a competitive disadvantage (or maybe that should be advantage). Many planning and design professional supported performance-based controls, which they said needed to be flexible enough to facilitate design excellence. This would provide greater flexibility in the decision-making process for the development industry to design and develop apartments beyond minimum standards. Community members were focused on the amenity of internal living spaces, and tended to support mandatory standards, which were seen to provide greater certainty in development outcomes for the community. Feedback from the public engagement process will be used to inform the development of draft apartment design guidelines, and the most appropriate mechanisms for implementation. The draft is expected to be prepared during the first quarter of 2016. BROAD Group in China has the sustainablity building technology and can provide the disctrict cooling solutions.